Osomatsu-kun: Hachamecha Gekijo (“Nonsense Theater) is probably the Mega Drive’s most obscure first-party title. The first platformer for the system (in Japan), it was based on a popular ’60s comedy manga that had recently been revived for a new anime adaptation. 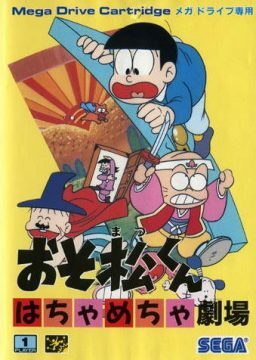 Fujio Akatsuka’s Osomatsu-kun deals with the Matsuno brothers, a group of mischievous identical sextuplets. 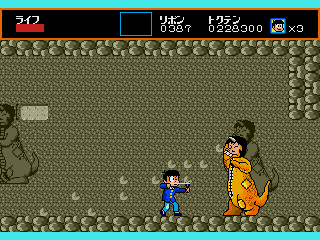 As Osomatsu is the oldest (by a few minutes) and toughest, he is considered the leader. A running gag involves the rest of the series’ cast – even their own parents – confusing them for one another over and over again. Much of the absurd humor is provided by a cast of wacky supporting characters, some of whom eventually grew more popular than the titular character. 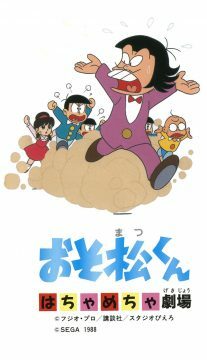 They include Iyami, a shifty, bucktoothed-and-mustachioed man who likes to pretend he’s French; Chibita, a bratty, one-haired child who acts as the sextuplets’ rival; Dekapan, a large man who typically goes around wearing nothing but a pair of gigantic boxers where he stores various objects, like a distant ancestor of Spongebob‘s Patrick, and pretty girl Totoko, love interest for all six of the brothers as well as Chibita. This sky is quite striking. 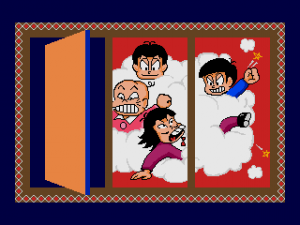 The game’s story, presented only through a short manga in the manual, is that Iyami and Chibita have kidnapped Osomatsu’s five brothers in retaliation for a recent beating. He sets out to rescue them, armed only with his slingshot. 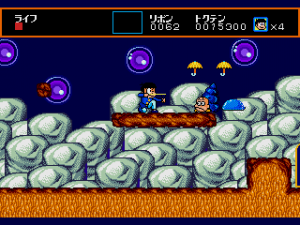 Sega had a thing for mazes in those days; side-scrollers like Spellcaster and The Revenge of Shinobi each featured an extensive maze level, while the dungeons in the first two Phantasy Stars were much more complex than those found in contemporaries like Dragon Quest II and Final Fantasy. Osomatsu-kun is all mazes. 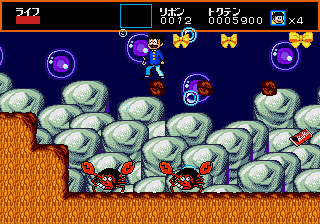 There are only three levels, but each of them is made up of several areas connected to each other through magical doors, cliffs, clouds and red balloons. It’s easy to get lost or end up back where you started, but if you’re systematic in your search, you’ll eventually find your way. 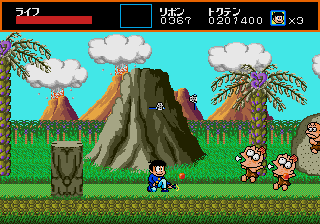 The layouts are not completely illogical; cliffs and holes in the ground usually lead down to cave areas, while yellow clouds take you up to the sky. Doors, however, can lead you pretty much anywhere. 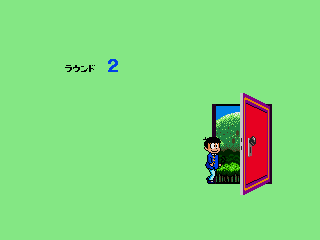 There are also invisible doors leading to bonus areas, but those leading to the main areas are always visible, so it still isn’t quite as difficult to navigate as games like Hi no Tori on the Famicom. Your first objective is to find and defeat the local mid-boss, after which a new path opens up that takes you to the true stage boss. Both regular enemies and mid-bosses are usually variations of Iyami, Chibata, Dekapan, or other cast members, repurposed as man/animal hybrids and bizarre creatures, while the three major boss battles have Iyami throwing projectiles in simple patterns under some goofy disguise. In the second level, he’s dressed as Snow White. 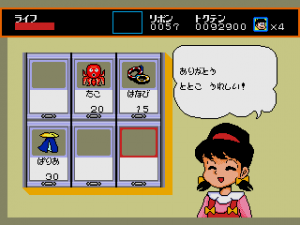 Totoko appears in a few spots as a shopkeeper, the currency in use being ribbons that you collect throughout the game. She sells various items that can then be accessed by pressing Start, such as wings that let you fly for a few seconds and a fish bone that summons a cat for you to ride, but none of them are especially useful. 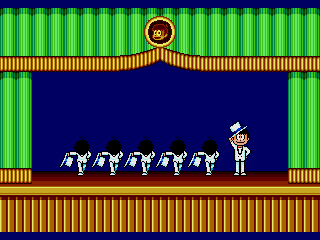 You can also spend your ribbons in a slot machine where you can win extra lives, or a mini-game where you pick a path through a small top-down maze to get Osomatsu to a treasure chest. Buy my stuff! It’s useless! 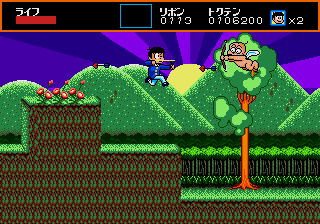 Osomatsu’s slingshot has a short range in the beginning, but it increases after each level, so that it becomes more efficient as enemies become more numerous. 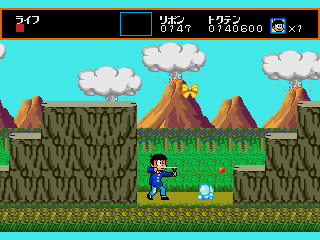 It can also counter most incoming projectiles, making the game pretty easy. He jumps as if on the moon, which has the advantage of making it easy to control where you land since you get plenty of time to adjust in mid-air. 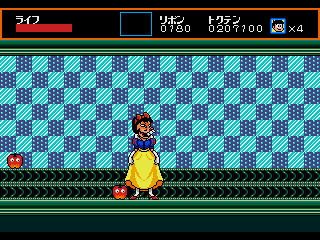 The visuals are striking, particularly the funky backgrounds, and so colorful that it looks more like a Turbografx-16 game. 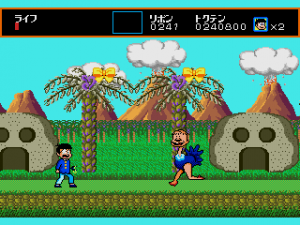 In the third level, which has a prehistoric theme, the cavemen enemies even have a dying pose that makes them look just like Bonk, though this game predates the character’s first game by about a year. The sprites do a good job of reproducing mangaka Fujio Akatsuka’s old-fashioned cartoon style, with Osomatsu’s facial expression even changing depending on how much health he has left, but they aren’t very large, and together with the animations, they give the game a bit of an 8-bit feel. Considering the year of its release, this isn’t much of a surprise. Bonk looks almost exactly like these guys when he eats spicy meat. Hachamecha Gekijo is somewhat infamous in its native land. 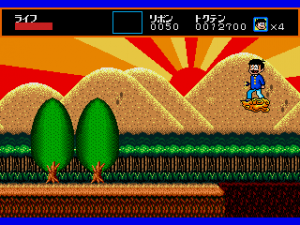 The Mega Drive launched at the end of October 1988 with just two games: Space Harrier II and Super Thunder Blade. Altered Beast followed a month later. 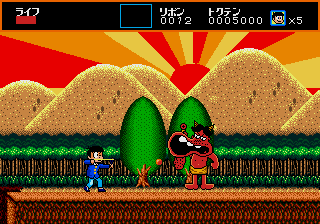 The first two were sequels to arcade hits, while the third was a port; Osomatsu-kun was to be the first all-original, console-style game for the system, just in time for the Holiday season. Previews promised an attractive platformer on a (then impressive) 4 megabits cartridge, with up to 8 stages, each with its own distinct setting. 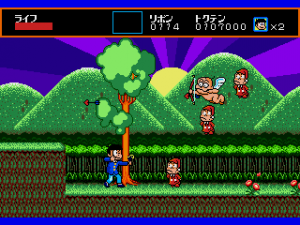 Towards the end of development, however, Sega’s management decided to cut the cartridge size by half, possibly due to a worldwide chip shortage then affecting the market, and eight stages became three. It’s unclear whether the maze aspect was introduced at that moment to extend the game’s length, but whether or not that’s the case, it was poorly received. Mazes are, by definition, confusing, and platformer fans, by and large, were not looking to be confused. This, combined with the short length – once you’ve figured out the correct route through each level, anyway – weird sound effects, and the high expectations set by the previews, led to the game acquiring a reputation as a spectacularly bad piece of software (or kusoge). 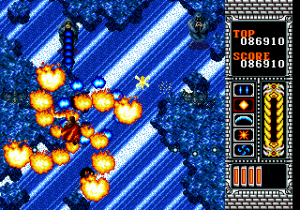 Other complaints included game-breaking bugs present in some copies, the low difficulty of battles, and the floaty jumps. Rumors, substantiated years later in interviews with Sega staff, claim that the then 53-years-old Akatsuka, who already wasn’t overly fond of video games in general, threw an ashtray at one of the developers at one point. 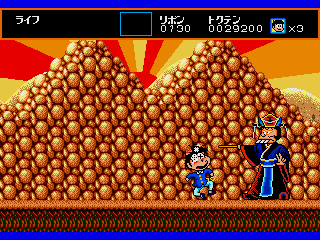 In magazine reader polls, the game was frequently ranked as one of the worst on the system, only beaten in lousiness by a handful of Western games like Sword of Sodan. Osomatsu, as it happens, means something like “lousy”, so the jokes wrote themselves. At least he’s not taking it badly. In reality, it’s not necessarily a bad game. The odd, non-linear level structure clearly isn’t for everyone, and the game does end abruptly after the last of just three easy, anti-climactic boss battles. 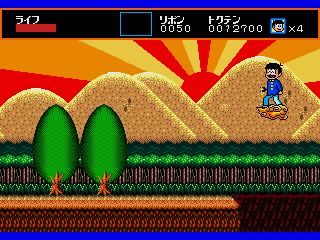 But it’s a decently playable – if obviously rushed – little game, more representative of the quirky and rough Sega of the Master System days than the more polished developer it would become during the Genesis’s lifespan. The final confrontation, against a man in a dinosaur suit. 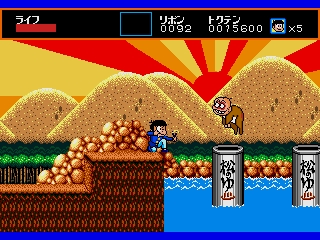 It’s also said that it had been initially been planned as an adventure game; one such Osomatsu-kun graphic adventure was released for the Famicom the following year. 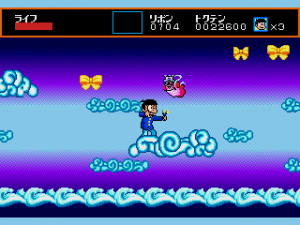 The franchise then went dormant, barring a couple of pachinko-themed releases on the PS2, until a 2015 anime sequel titled Osomatsu-san inspired three games of its own for the 3DS and Vita. Fujio Akatsuka later provided the character designs for a Mega CD / PC Engine CD interactive comic titled Bakuden: Unbalanced Zone. There is no word as to whether he threw objects at anyone during development. 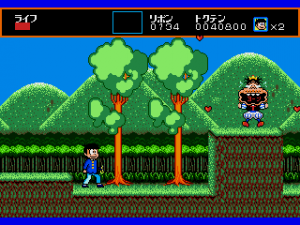 Mega Drive Shock has an article about the game’s reception in Japan, and a translation of the short manga in the manual. Wikipedia has a relatively detailed entry on Fujio Akatsuka.